COMMENTARY ON "The 'Change' of the Law"
This week’s lesson is the heart of Adventist eschatology and salvation; it argues that the 10 Commandments ant the Sabbath are eternal and continuing, and it argues that the Sabbath is the final mark that identifies the saved. In spite of all the evidence, the clarity of Scripture, the excellent teaching available—in spite of everything, Adventism cannot let go of its confused doctrine that insists Grace is realized somehow in the Law. This week a regular reader of Bible Studies for Adventists, Jeanie Jura, has submitted her comments regarding several of the lesson’s points. I will share them as we address this central doctrine of Adventism that skews the gospel and mis-teaches the truth of Scripture. This statement assumes that Sabbath and the Law are part of the final conflict coming on the world. It further assumes that there has been an “attempted change of that law”. Adventism’s claim that the pope changed the Sabbath to Sunday is a claim which essentially only Adventists and Catholics believe. Because Catholicism has published encyclicals stating that the religion had changed the day of worship, this claim is not credible to Christians at large. Christians who understand the gospel and the new covenant know that any claim to “change the day” is superficial and false. The biblical Sabbath can’t be changed, and Christians do not, for the most part, keep Sunday instead of “Sabbath”. This claim serves to hold Adventists in reactive fear and defensiveness, but Christianity does not believe Sunday is the “new Sabbath”. It is a non sequitor to say, “no longer condemned by the law; indeed they obey it”. It doesn't make sense and in fact is directly contrary to the teaching of the New Testament. The Law condemns us and drives us to the Savior, but it cannot save us itself. When one accepts the free gift of forgiveness, new life and salvation, one is no longer condemned by the Law. Jesus paid the price—He fulfilled the Law, so no—we are no longer under its condemnation when we are in Him. But all that the Law can do is condemn. Therefore, if we put ourselves back under the Law, we have put ourselves back under the condemnation of the Law. Instead, we are now under (or led by) the Spirit, not the Law: “But if you are led by the Spirit you are not under the Law” (Gal. 5:18). This is an either-or statement, not both at once. According to 2 Corinthians 3, the Law and the Spirit are opposed to each other. If we are a slave to one, we are not a slave to the other. This fact is beautifully demonstrated in Romans 7. First Paul uses the illustration of marriage—being bound to another. Once that one is dead, the spouse is no longer bound to him (the Law). In verse 6 it is clearly stated that we are released from the Law and now serve in newness of the Spirit rather than oldness of the letter. And by “the letter” Paul is speaking of the Law written on stone. He spent quite a bit of time contrasting what was written on stone—the letter—with what is written on the heart by the Spirit. He even goes so far as to say that if the one married joins herself to another while still married, she is an adulteress. That is what happens when we try to hang onto the Law while clinging to Grace. It is spiritual adultery (Romans 7:3). Did that which is good, then, bring death to me? By no means! It was sin, producing death in me through what is good, in order that sin might be shown to be sin, and through the commandment might become sinful beyond measure. For we know that the law is spiritual, but I am of the flesh, sold under sin (Romans 7:1–14). No one (or very few) are saying that the Law is nullified. Romans 3:31 clearly says that it is not nullified but established. Nullification is not the issue; the issue is this: why are you trying to keep a law that has been fulfilled? Jesus fulfilled all of it—every single part of it—in His death, burial, and resurrection. Going back to the Law nullifies grace and the finished work of Jesus (Gal. 2:21). But saying that the Law is not “nullified” does not mean that it is still binding. Importantly, it has not been nullified, but it has been fulfilled. The two are not the same thing. He is saying that the Law did not cause death, rather sin did. The commandment showed that sin is “utterly sinful”. But when a person knows that sin is utterly sinful and comes to the Savior, the Law has done its job. Hanging on to the Law after trusting in Jesus’ completed atonement would be like following the signs on the freeway to one’s destination, taking each sign down on the way and carrying it in one’s growing collection in order to “follow it” all the way. Once the Law has pointed out the way, you no longer need it. It is not eliminated—it is still there for those who need it later, and it still is the evidence that the Lord Jesus is the true Messiah to which the Law pointed—but for the one who believes, it has done its job. It has been fulfilled by showing us our sin and for pointing us to our Savior, and we no longer need its guidance. Today’s lesson addresses “The Seventh Day in the New Testament”. The author attempts to argue that the New Testament endorses the continuation of Sabbath-keeping by Christians. In fact, it never does so! Yes, they still rested according to the commandment because they were still under the Old Covenant which pointed forward to the Messiah. It was not fulfilled until He finished His work of death and resurrection. Once He came and fulfilled the Law, which pointed forward to Him, there was no more need to point forward. In fact, although it is not pointed out here, Adventists will often say that Jesus Himself kept the Sabbath and indeed the whole Law. Therefore, they argue, we have to do the same thing, That argument, however, is not correct. He came “under the Law” to fulfill the Law. After He kept it perfectly, He paid the price for our failure and inability to do so, thereby fulfilling every requirement of the Law—including death for breaking it—and completed the purpose of the Law which was pointing forward to Him. The lesson completely misrepresents this passage. In Philippi, Paul did not meet to teach in a synagogue as he always did in a new town. Apparently, there was no synagogue in Philippi. According to Jewish law, ten men were required for a synagogue to be established. The fact that there were no synagogues in Philippi suggests that there were not enough Jews there at that time to sustain a Jewish meeting house. Jewish law further stated that if a synagogue was not present, Jews could meet to worship at a convenient meeting place such as a river bank. This meeting at the river was not a meeting of BELIEVERS, as the lesson states, but a Jewish assembly. The fact that gentiles such as Lydia were there simply indicates that there were “believing gentiles” present, or gentiles who had accepted the Jewish faith (a legal and common religion in the Hellenistic world). They were not Christians, however. Paul preached to these women at the river, and Lydia, one of those present who was “a worshiper of God”, listened intently to Paul. “The Lord opened her heart to respond to the things spoken by Paul. And when she and her household had been baptized, she urged us, saying, ‘If you have judge me to be faithful to the Lord, come into my house and stay’” (Acts 16:14-15). Lydia became the first convert to Christianity in all of Europe! She had been a believing gentile who had not fully embraced Judaism, but when she heard Paul preach the gospel, she believed and was baptized. For the lesson to use this event as an indication that there was “no change in the Sabbath” is a completely illegitimate use of the story. These were Jews who needed to know the truth about Jesus, and Lydia became the first Christian in Europe. That Sabbath meeting was a JEWISH assembly, not a Christian one! For whoever keeps the whole law but fails in one point has become guilty of all of it (James 2:10). Jeanie comments: “Notice that it ways the ‘whole law’, not just part of it. ‘All’ includes the so-called ceremonial law, but who keeps that? Thus he said: “The fourth beast will be a fourth kingdom on the earth, which will be different from all the other kingdoms and will devour the whole earth and tread it down and crush it. As for the ten horns, out of this kingdom ten kings will arise; and another will arise after them, and he will be different from the previous ones and will subdue three kings. He will speak out against the Most High and wear down the saints of the Highest One, and he will intend to make alterations in times and in law; and they will be given into his hand for a time, times, and half a time. Jeanie observes, “There is nothing there that speaks about the origin of Sunday keeping. Yes, he will ‘intend to make alterations in times and in law’, but there is no logical reason to take that to mean ‘change Sabbath to Sunday’. That meaning is only read into the text to fulfill a specific agenda. Jeanie remarks again: “One of the first times ever when it is admitted that it is not laid out in black and white. At least that is a true statement. But they then drift smoothly into the assumption that it IS clear and unambiguous—a real bait-and-switch method of a trickster’s sleight of hand. “Papal Rome” was not even in existence in the second century when the Lord’s resurrection was celebrated on the first day of the week. This is so illogical as to be absurd. Merely saying ‘worship the God who created all’ does not automatically reference the seventh-day Sabbath or a supposed binding command at the end of the world for all to keep the seventh-day Sabbath for all eternity. 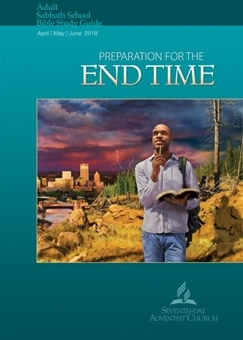 And to say that the final endtime crisis will be over the day of worship is to read one’s own assumptions into the text—eisegeses, not exegesis—which is a dangerous way to read the Bible. By this method—eisegeses—one can prove literally anything one wishes to prove. Today’s lesson features a quotation from The Great Controversy and typical Adventist arguments for endorsing the Sabbath as the focus of Satan’s final attack. The clarity of Adventism’s assertion that the Sabbath is Satan’s target as the sign of God’s authority is completely unbiblical and anti-christ. Jesus, not the Sabbath, is the final focus of loyalty. Jeanie’s answer is clear: “As noted before, for the most part, no one is arguing that the law has been ‘done away with’. Rather, its job is to point out the need for the Savior, and once it has done that, it has no further use for the one who has come to the Lord. Her answer is important: “This is a very leading question to be sure. ‘Keeping the seventh-day Sabbath’ cannot earn you salvation, of course. But that isn’t the point. The point is, do you believe that salvation is given by faith but is kept by Law-keeping? Most Adventists would say, “No”, but that answer wouldn’t be truthful. When we insist that keeping the law is a necessary part of being worthy of salvation, we completely negate the new covenant in Jesus’ blood. Jesus came to fulfill the law, and believing in Him is our sole requirement for salvation. Sabbath is not the sign nor the seal of God. Rather, the Holy Spirit is the seal that marks believers and guarantees their eternal life and inheritance (Eph. 1:13-14). To insist that the Sabbath will be the object of Satan’s fury and the mark of those loyal to God is to negate the gospel and to establish a false god in a created day. Jesus is the fulfillment of the law. He is the Source of life and the guarantee that in Him our future is secure. Knowing Jesus is the one thing we need; keeps the Sabbath and will elicit no pleasure nor credit from God on that day!